A while back, I attended a Fox press event where they showed the first act of Logan, the third and likely final solo outing of Hugh Jackman’s Wolverine. For me, who was not sold on giving this character another movie, the 40 minutes I saw more than proved this movie’s worth. Logan starts with the titular character sleeping in his car, just in case you wondered how bad things are for the X-Man. He wakes to find men trying to carjack his limo, and has to fight them off. But this isn’t the berserker Logan we’ve seen before, he’s tired; he doesn’t want to fight at all. He’s clearly only doing it because he needs the car. And he’s also not healing as well as he should—when his claws come out, the extend slowly, painfully. And after removing one of the attackers’ arms and putting his claws in another man’s head—not the only time we’ll see that move, going by the international trailer—Logan gets away. But he doesn’t get away clean, as the shots of him bleeding in a bathroom make clear. 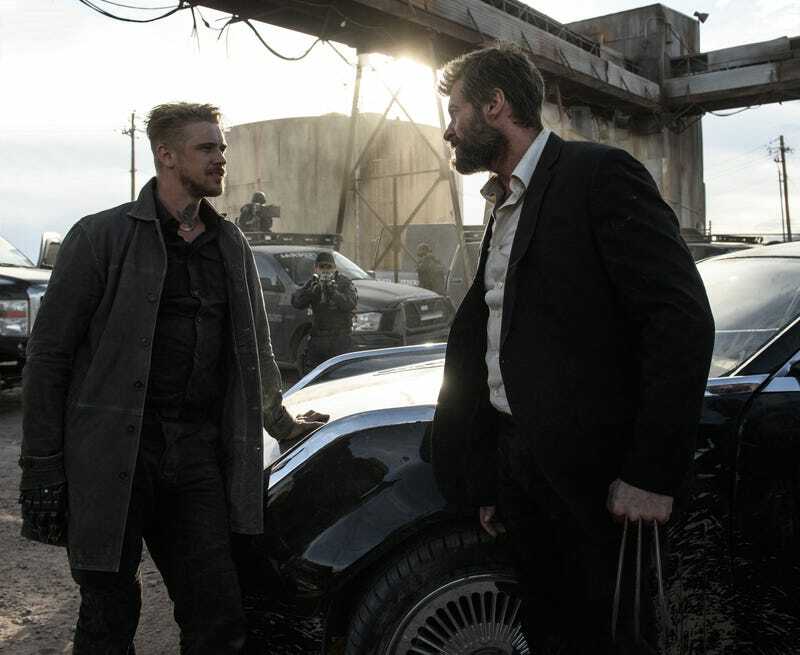 Pierce says that he found Logan because, well, the kind of violence left behind from the opening fight—and the way it was reported—let him know the Wolverine was around. He also asks if a woman has found Logan, and Logan says no. But while Logan is on a job at a funeral, he’s approached by a woman begging for his help. She claims to be the mother of a girl named Laura (Dafne Keen), and offers Logan a lot of money if he will drive them to North Dakota, where she has friends that will get them safety. Meanwhile, in Mexico, Logan has teamed up with Caliban (Stephen Merchant) to keep an off-his-rocker Charles Xavier (Patrick Stewart) from a) being found b) having a “seizure” which will break the brains of everyone close enough to feel it. This is is why Logan was procuring medicine earlier. He’s been giving Xavier the pills to prevent the seizure. Charles is being kept in a overturned storage container, which keeps his psychic outbursts relatively contained. Also, it has a tonne of holes in it to make for stunning visuals as pinpricks of light illuminate the sadly diminished Xavier, who can barely move and is barely lucid. Also, he curses a lot. This Xavier loves the f-bomb, just saying. The reason Logan’s so desperate for money is clear: he wants to buy a boat and get himself and Charles on it, away from everything. And he’s probably going to leave Caliban behind, in case you were wondering how limited Logan’s connections to others has become. Logan goes to the hotel where Laura and her “mother” are, but the woman is dead, so Laura joins him on a drive back to the hideaway in Mexico. (There’s also a glimpse of an X-Men comic book in the room.) Unfortunately for Logan’s desire to stay out of everything, Pierce’s minions have followed Laura. And, complicating any plan to give Laura back, Xavier has taken an immediate liking to the young girl. He says that she’s the mutant that he was talking about, and that she’s “like” Logan. Interestingly, while the girl never speaks out loud, Xavier’s downright chatty. That’s when the real surprise of this movie happens: Laura kicks the arse of the people sent after her. She walks out with a severed head in her arms and, with claws and a healing factor of her own, and proceeds to demolish Pierce’s men. Where Logan’s fighting is old and slow, she fights fast and precise. The whole time, Xavier is telling Logan they can’t leave Laura behind, begging in a feeble voice. And, I’ll tell you, it really feels like there’s a 50 per cent chance that Logan will still leave the girl behind, just to avoid the trouble. He doesn’t, of course, but Jackson does a marvellous job showing you how much Logan wants to escape, and leave everything behind. But he doesn’t, and Logan, Laura, and Xavier escape by driving the limo through a fence. Logan is dark. 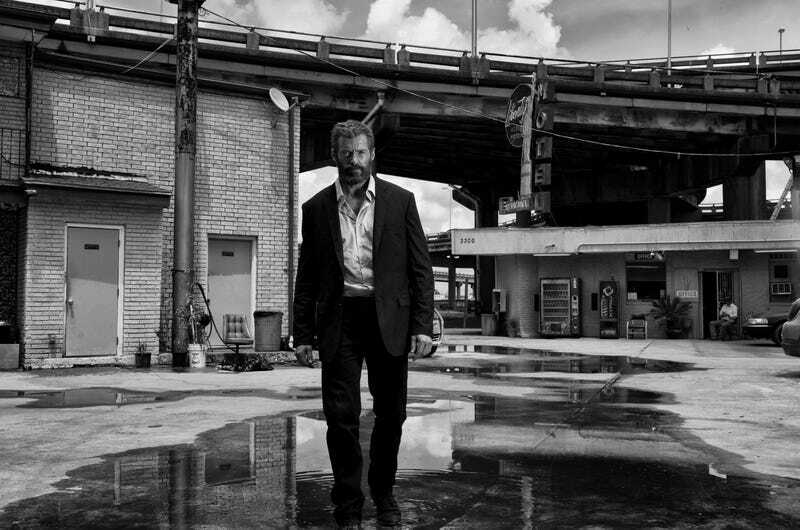 Logan is gritty. Logan is all washed-out colours, sand and rust. And for all of that, it works. This is a movie that’s telling a standalone story, but mining our knowledge and affection for the characters and actors to do it. None of this would be as affecting if we hadn’t seen Patrick Stewart and Hugh Jackman in these roles for so long. That’s what makes the bearded, limo-driving Logan, one willing to abandon a mutant girl, a “disappointment,” as Xavier’s semi-addledly describes him early on. And Stewart’s Xavier, who has been a stalwart father figure for over a decade, is so diminished that it hurts to see him. It is unspeakably depressing. Both actors seem determined to make what is likely their last big outing as these characters as good as possible, and it shows. But the newcomers are just as good. Boyd Holbrook’s Pierce has got a drawling sarcasm and dickish grin that makes you both like him and long for Logan to kill him. And Dafne Keen is seriously amazing as Laura/X-23. For a child actor who doesn’t get to do much speaking and did, we were told, a lot of her own stunts, she’s steely, and weird, and still, somehow, a child. She’s everything this character, who gets Logan and Xavier started on their last heroic quest, needs to be. All the actors, the action, and look of the movie make it a delight to watch. Logan looks great. And what we saw only makes us want to see Logan, Xavier and Laura’s road trip all the more.